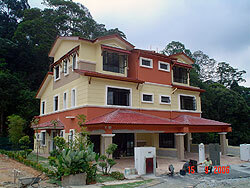 Several kilometres southeast of the city centre, the family-friendly suburb of Cheras is mostly residential. It is known for the 100-acre Taman Tasik Permaisuri, a popular but well-kept public park with gardens, lakes and narrow winding lanes that curve around a small reflecting pool with fountains, around which people love to jog in the mornings. The park provides a safe exercise place for the health buffs who flock to the park every day. On Sundays they can also join the exercise classes that are held in one of the park's open fields. Weekly open-air night markets called pasar salam are popular here. The biggest and most famous pasar salam is held at Taman Connaught (Connaught Park) on Wednesday nights.